Posted on November 10, 2016 February 4, 2019 Euro Car PartsComments are off for this post. 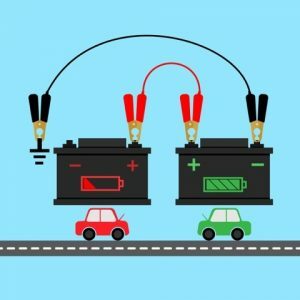 I’ve written this blog to give you an easy to follow guide on how to jumpstart a car with a flat battery. 1. Before you reach for the jump leads, be sure to switch off your ignition. The same applies to the vehicle you’ll be using to jumpstart your battery from. 2. Ensure both vehicles are parked close enough for the jump leads to reach each vehicle’s battery, but far enough away so that the bumpers aren’t touching. 3. Make sure both vehicles are in neutral with the handbrakes on before you attempt a jumpstart. 4. Spread out your jump cables so you have one red and one black in each hand. From this point on you don’t want the cables to touch each other. 5. Start by connecting the red jump lead to the positive terminal of the car with the flat battery. The positive terminal of the battery will be slightly bigger than the negative and will usually be marked with a + symbol and have a red cable connecting to it. 6. Once this has been done, connect the other end of the red jump lead to the positive terminal on the good battery. 7. Grab the black jump lead and attach it to the negative terminal of the good battery. The negative terminal of the battery will be slightly smaller. It will usually be marked with a – symbol and have a black cable connecting to it. 8. Once this has been done, you want to find a bare piece of metal (on the car with the flat battery), which isn’t a moving part to connect the final black jump lead (ideally the metal isn’t directly connected to any electrical components). This will act as a grounding point to complete the circuit. DO NOT connect the final clamp to the negative terminal of the flat battery. Connecting the final clamp to the negative terminal of the flat battery can create a spark. Flat batteries can produce hydrogen gas, which is highly flammable, the last thing you want is for the battery to explode. 9. Ensure the jump leads are free from any moving parts – such as fans or belts – and then start the engine of the car with the full battery. 10. Leave the engine running on the car you’ve just started for about two minutes. This will help to charge your vehicle’s flat battery. 12. Once it has started, remove the jump leads in the reverse order they were placed. 13. Pop your leads away, close the bonnets on both vehicles and safely drive away. Try to drive you car for at least 20 minutes in order to give your battery sufficient charge to start again. This should help you avoid needing to jumpstart it again. There’s nothing worse than turning the key in your car and discovering that your battery is flatter than a deflated tyre. So the next time you need of a quick fix, be sure to grab those jump leads and follow the steps above in order to get things moving as they should. Interested in keeping your battery in tip top condition? Be sure to read our guide to battery care and stay ahead of the game this season. And don’t forget, if you’re reaching for the jump leads more frequently than you should, you can find all sorts of long-lasting options within our current range of car batteries.